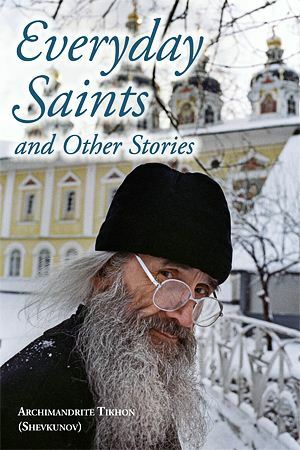 Everyday Saints and Other Stories, the English version of Russia's number one bestseller, was released in the U.S. on October 1, 2012. Archimandrite Tikhon will present the book and answer questions at the Library of Congress in the European Conference room of the Jefferson Building, at 11:00 am, October 5, 2012. He will also be available for select interviews, upon request. A national sales success reminiscent of the Harry Potter phenomenon, this amazing work portrays people the author knew personally who were like Dostoevsky's starets Zosima. It has already won two Russian national awards: the prestigious "Book of the Year" award, and the Russian Internet Award. There were 30 times more votes for this book in the Internet competition than the next runner-up. The phenomenal success of Fr. Tikhon's book is "causing a real shock to all the booksellers in Russia," as one baffled critic has written. This book, written by a priest and modestly displayed in several Moscow bookstores, not only instantly exhausted its print run of 60,000 copies, but also a second printing of 300,000 copies. Those copies left the shelves within one month. Less than a year has passed since the book's release and the book has been reprinted six times-a total of 1,100,000 copies. The total number of electronic versions purchased is estimated at no fewer than three million copies. Moreover the book is being translated into 10 European languages and will soon be sold all over the world. With recent attacks on the clergy by the media, it is hard to imagine anywhere in Western Europe or the United States where a book written by a priest, about the church, would not only become a runaway national bestseller and leap off the shelves of the all the secular bookstores, but also cause traffic jams on Internet sites. What is the secret of this book's success? First, the author's undisputed talent. The book is extremely engaging and reads like a good detective novel. Second, all the stories are brimming with an inimitable light, joy, and good-natured humor that we all seem to have forgotten still exists. It is a longed-for dose of positivity. Besides, all the stories are true. Reading about one miracle after another, the author's co-religionists may understand the events described as quite normal, but others are left utterly amazed. They might even find them hard to believe if it weren't for the fact that many of the people involved are still alive and well known. And most everyone can recognize such late protagonists as Boris Yeltsin, Sergei Bondarchuk (producer of the internationally acclaimed War in Peace), or WWII hero Marshal Zhukov. It is a glimpse into the unfathomable Russian soul - some call it mysterious, others enigmatic, but no one will regret their effort to enter this uncanny, beautiful world. "The book, written by the monastery's Abbot, Archimandrite Tikhon Shevkunov, is terrifically engaging thanks to its depth and evocative storytelling. An instant sensation on the Russian literary scene, Everyday Saints and Other Stories has already received several prestigious awards. For the first time in decades, a book written by an Orthodox priest, a monk, has sold over a million copies and become a hot topic of a nationwide intellectual debate. People read it on their commute and discuss it with their friends and families. The secret of Father Tikhon's literary success lies not only in his talent but also in his remarkable sincerity. The author cuts to the very heart of the problems of our human existence and inner life. Without becoming moralistic or didactic, he focuses the reader's attention upon eternal, unshakable values." "Father Tikhon has successfully fulfilled an extremely important task, combining the ability to formulate the problems of life with true faith using modern language, beginning a dialogue with modern man on his own territory, yet avoiding all banality and primitive cliché… The author refuses to fit faith into the framework of piety in order to make it more appetizing, or even presenting it at the cost of diluting or changing it. He does not stand on a pedestal or try to convince anyone; he only recounts his own experience, sharing it, but never playing upon his listener." - Antonio Mennini, Apostolic Nuncio in Great Britain. "Fr. Tikhon's style is eminently readable and accessible to the general reader, and the translation into English is excellent… It is a great contribution to the literature on contemporary Orthodoxy and should go far in increasing awareness of and knowledge about the Orthodox Church in the West." - Harold Leich, Russian Area Specialist, the Library of Congress. The book is available for purchase on PokrovPublications.com. The Russian version, Несвятые Святые, can also be purchased on PokrovPublications.com. Sample stories and more information can be found on the book's official site, Everyday-Saints.com. Journalists wishing to attend one of the Moscow Sretensky Monastery Choir concerts can receive accreditation via pr@maestroartist.com. Full schedule of the US tour is available at http://www.camimusic.com/choir. The book is also available in Greek.